It’s been almost a year since Mr. Gish and I made the move from San Francisco to Oakland. We left behind our first Bay Area apartment, the ability to walk to work, and living above a Starbucks. What we have now are trees (how I missed trees! ), cool neighbors (that we’ve actually met), living in a bitchin’ city, easy access to San Francisco if we want it, and a home that we can call our own. There’s something about this electric green color that always draws me to it. I’m not into bright colors generally, but I do love this green. I was inspired by these polka dot cookies I saw a while back. To decorate the houses, I made some gray and white royal icing and had them both at the ready. I’m still very new to this, so I decorate one cookie at a time. 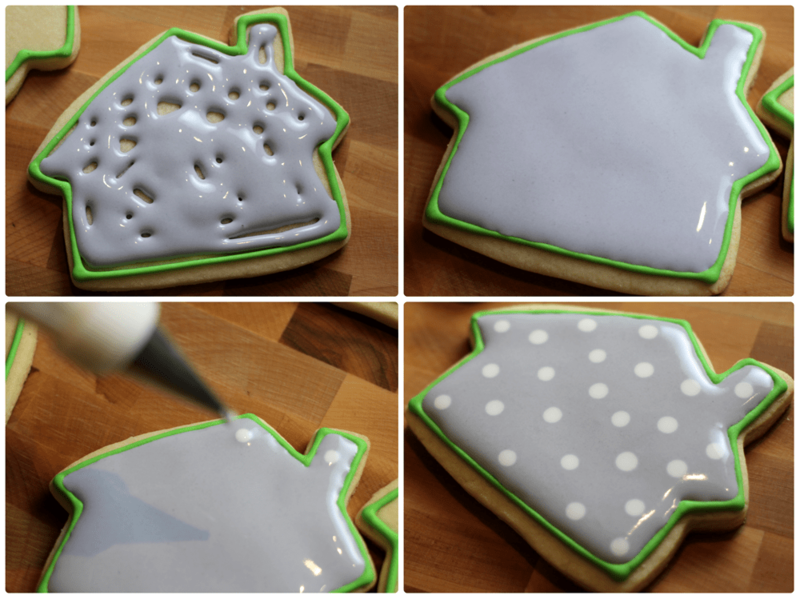 I filled the cookie entirely with the thinned out gray icing and then went right back and dotted the gray with thinned out white icing. Oh yeah, I made some light orange and gray cookies too. What can I say? I like a little variety. 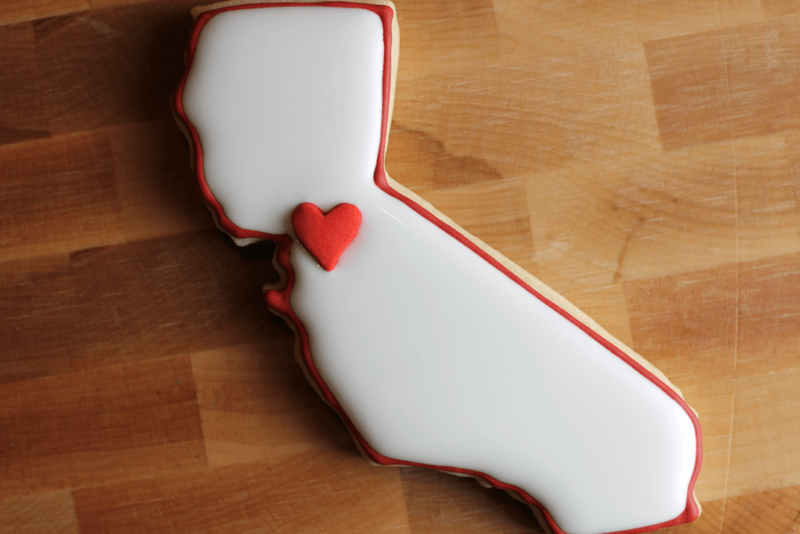 I then decorated these here California cookies. I wanted to keep these simple, so I outlined them in red to match the red hearts I was using. Once the red outline was dry, I filled them with white icing and placed a heart onto the wet white icing. Home is where the heart is. Get it? With some extra electric green icing I had, I used a #1 tip and got some writing practice in. This was actually the first time I’ve ever written on a cookie. Not bad, right? What did you use to make those different colored icings? Hi Abby! Sorry, I didn’t see your comment before today (yikes). I used royal icing for the frosting and got the different colors using a teeny bit of Super Black, Orange, and Electric Green from the Americolor food color brand. where do you buy your royal icing? or do you make it yourself? Mix the meringue powder and water in a large bowl and mix with an electric mixer for about 10 seconds – until it’s generally mixed together and nice and froth. Add in the powdered sugar and mix for several minutes, until the consistency is on that you need. To start, I generally mix until the icing still has a bit of “flow” to it. Right around where a line drawn by a butter knife through the top of the icing will disappear in about 10 seconds. Did you make the green icing as well? If so, how? If not, where did you buy it? 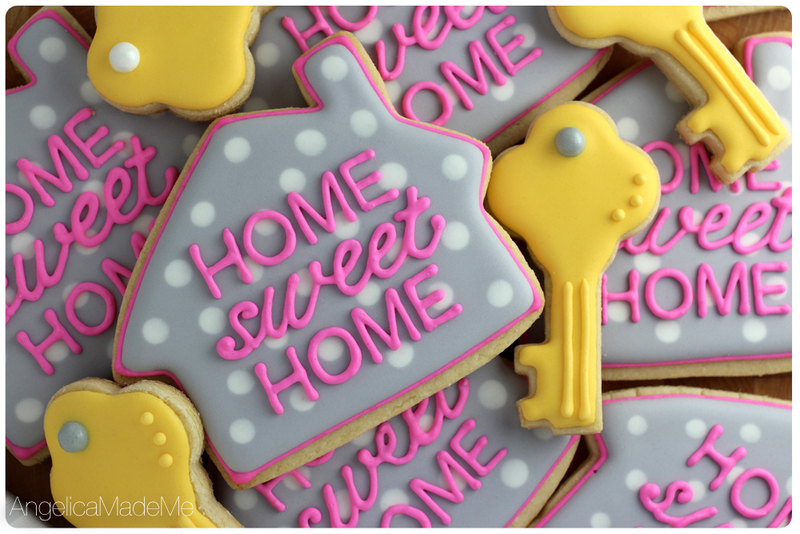 Totally stealing this idea for our housewarming party next week! Hi Taylor – yes, I do make the green icing as well. It’s also made from royal icing (4 Tbsp meringue powder, 1/2 cup water, 16 oz powdered sugar) and it was tinted with “Electric Green” food coloring. It’s super vibrant and pretty – I love it! Wow! Look amazing! Can you give me the recipe for the cookies? I would love to make this for my housewarming party. Can they be frozen in Advance? Thanks, Deborah! 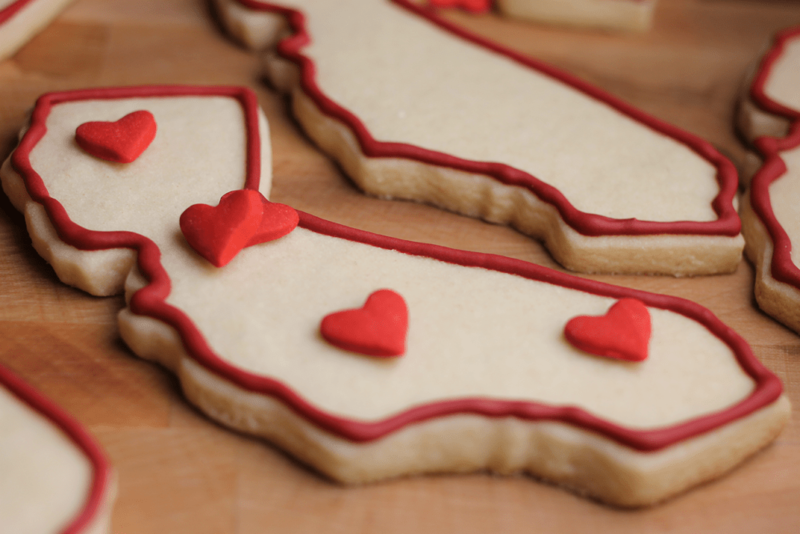 The recipe I use for my sugar cookies is this one from Bake at 350. And, yes, they can can absolutely be frozen in advance! 🙂 I do it all the time. Just stack them in a ziplock freezer bag and place them in a tupperware container. To unthaw, just leave them out on the counter overnight at room temp while still in all of their containers/wrapping and they’ll be great. 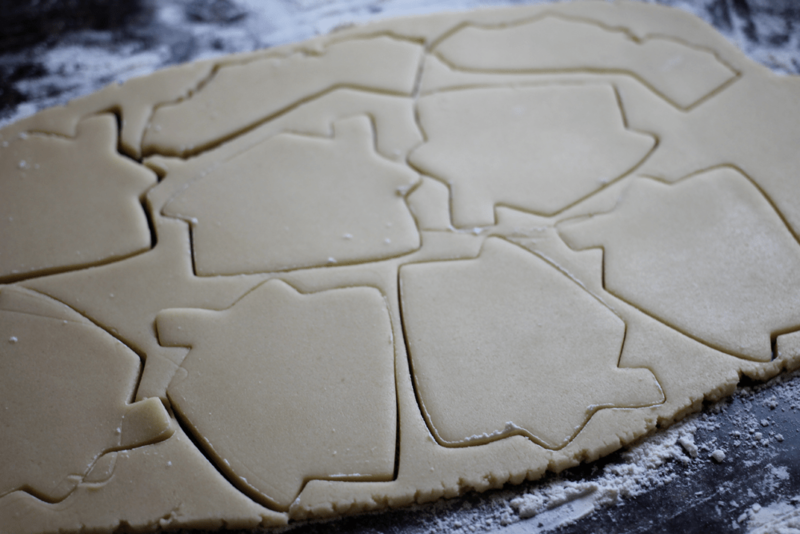 The cookie cutter is about 4-inches across and 3-inches high. I’ve had it for a while, so I unfortunately don’t remember where I got it. I always pick up random cookie cutters here and there, so it could have been anywhere 🙂 There should be lots available online, though. Might be the way to go. 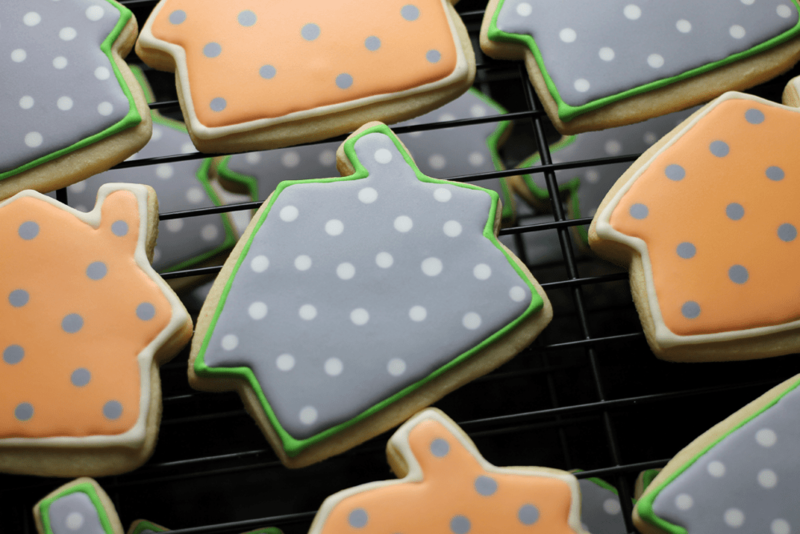 Hi Kim – I use usually make one batch of royal icing per 12 cookies I’m decorating. It’s truthfully enough for decorating just over a dozen, but I tend to play it safe and count on decorating 12. I don’t flavor the icing, but I know lots of people do with and love it. I find that the vanilla-almond flavor of the sugar cookies is totally tasty, so I don’t add any flavor to the icing. It totally tastes great as-is. These are beautiful! How long do you need to wait to pipe the words? Do you need to wait until the flooded icing is completely hard or can it still be in the drying stage? Thank you! Thanks, Lindsey! I wait until the flooded icing is completely dry before adding the words on top (several hours or overnight). This keeps the letters from sinking down into the flooded area, plus helps minimize possible color bleeding between the letters and the flooded area. Angelica your work is simply perfect!! Are your cookies for sale? Thank you so much, Victoria! Yup, I do sell cookies. Because of the kind of baking I do, however, I’m only able to sell to local folks here in the bay area. I use Ateco size 00 or 000 for nearly all my writing, but I believe these were done with a size 1. I’ve gone with smaller piping tips as I’ve done more decorating. Did you use the Kopy Kake with a certain font? If so, what font did you use? 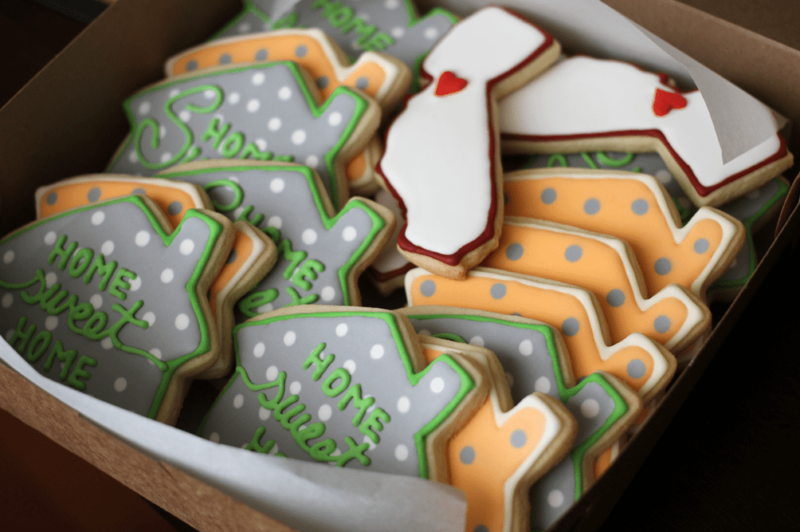 Yup, I used a projector when I decorated these cookies. 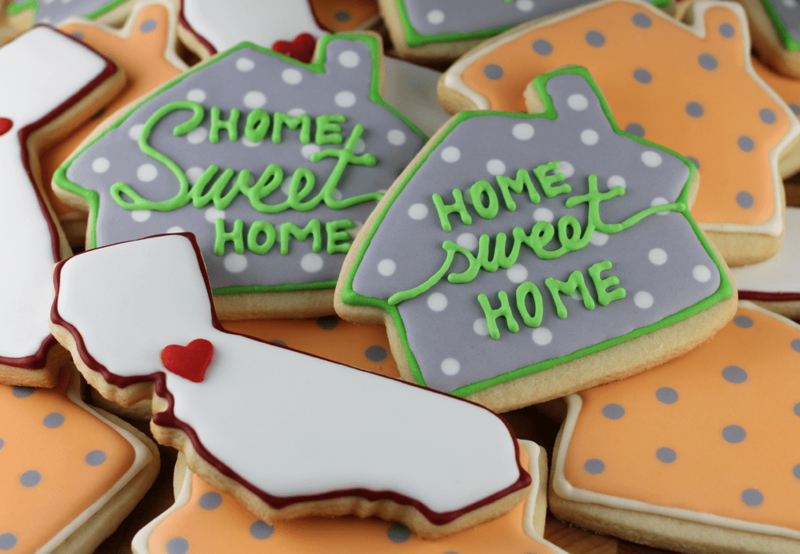 I don’t have the original file, but I believe “home” is plain old Arial. Not sure about the “sweet,” but any script font should look awesome. Hello , I’m planning a housewarming in the spring sometime .. R u able to make and ship ? Hi Erica – I’m happy that you liked the cookies, but I unfortunately don’t ship cookies. All of the orders I’m able to fulfill are for pick up from me in Oakland or local in-person delivery. 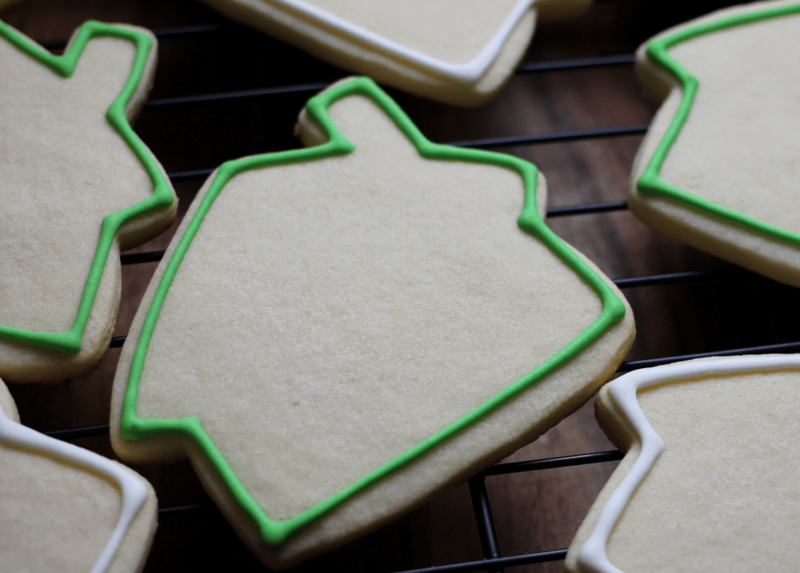 Best of luck on your cookie search!